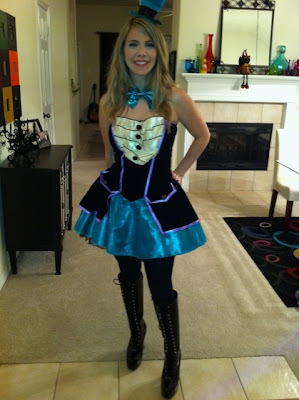 Before heading out I made a few minor adjustments to my Mad Hatter costume. Adding boots and removing a jacket that was included made it much more concert ready! After leaving Houston Friday morning, then passing through San Francisco we landed in Reno, Nevada. The mountain views were gorgeous from our room at the Grand Sierra Resort. My friend Shyanne flew in from New Mexico for the weekend as well and we started off our trip by gambling in downtown. We all lost! :( LOL! Gabe is giving the slot machine a piece of his mind for taking his moolah! The slot machines can make your head spin after awhile. Thankfully we had other ways to spend the better part of our Saturday! 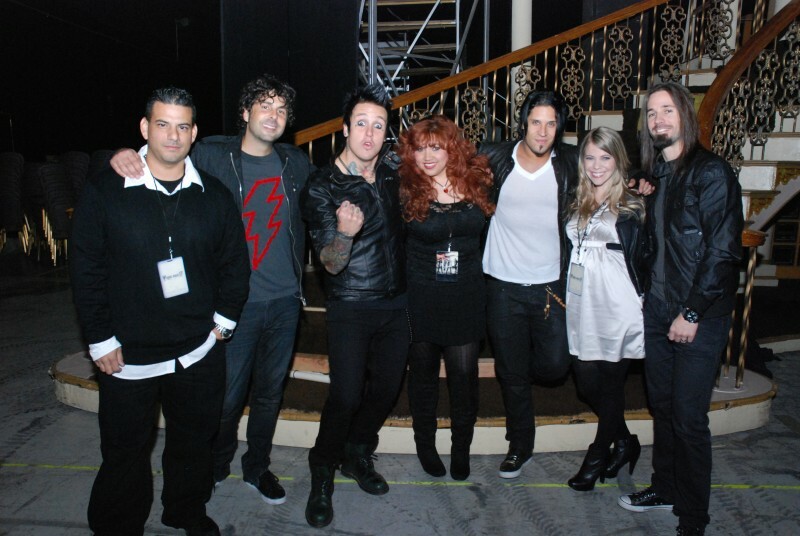 The last Papa Roach show of their Monsters of Annihilation tour was that night. Gabe and I dressed up for the show. Here I am with the pimp daddy himself. LOL! 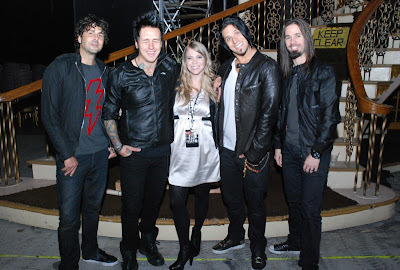 Of course I can't chronicle a Papa Roach show without adding a couple of pictures of the guys themselves! Here I am with them making fun of me for blinking! LOL! I love those goofballs. We had an amazing weekend of costumes, friends, awesome music, parties, meeting great new people and travel. Now it is your turn! I want to hear all about your Halloween fun! Wow, it looks like you had a ton of fun! I love your costume. not much to report over here. Didn't dress up. Went to a local theater production of a murder mystery. Oh my goodness - you look way better than that model you showed wearing that costume!! Whew.. gonna need a cold shower now. Oh, you look so adorable in your Mad Hatter costume! Thanks for sharing the photos. Pam-I sure did! I wish I could do it all over again! :) Thank you! A murder mystery sounds perfect for Halloween! Intense Guy-You are way too kind! :) Thank you! I did have a marvelous time! It was so much more awesome than I had ever expected it to be. Aww thanks...I am always thrilled to hang out with them. :) Yes those darn slot machines! After Vegas, Biloxi and Reno in the past few weeks I am staying away from casinos for a bit! jhitomi-Thank you so much! I had so much fun wearing that thing. Felt a little silly at first but I embraced looking like a cupcake after a while! LOL!